Manualidades por mi: A Joyful Rudolph Day. Well the 25th has crept up on us again. Fortunately I made my cards a week or so ago, but I have only just got to the computer to post them. I am still looking for designs that don't require too much colouring and hand-cutting as my arms continue to be a problem, so I went through my Silhouette Cameo library looking for a file I haven't used before, and came across the cutting file for this word Joy. I had some heavyweight dark red, pearlised paper that I knew would cut well, so I used that. I tried it on a few cards and decided it looked best on plain cream, so i used that to make the base card. To 'ground' the word I used the off cuts of the red with a Signature die to cut the starry border. I collected all the little stars that came from this, and dotted them randomly around the image. Then I used another die - Memory box I think but I am not sure - to cut a star of Bethlehem from gold mirri card, and glued it over the star in the original image. Because this used half an A4 sheet of the red paper, I cut it a second time from the other half, and made another card the same. Then I went through my stash and found similar pearl, non-fibre paper in silver, pewter, and stone, so I cut two sets from each of these. 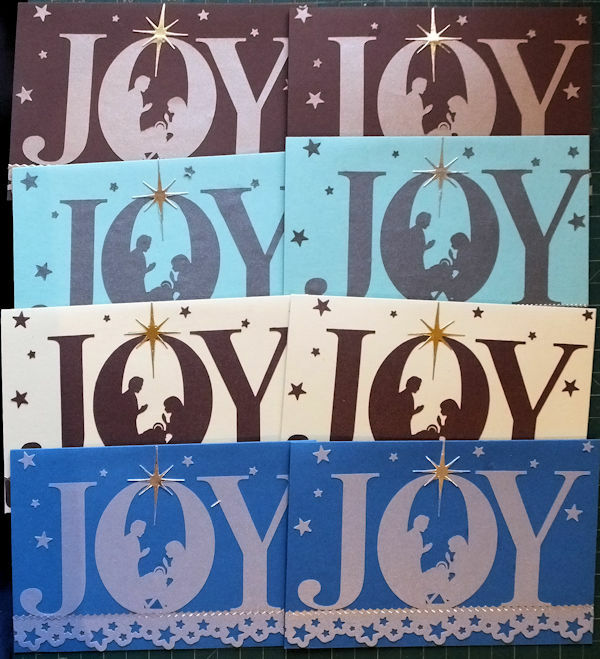 I paired up the silver with turquoise card, the pewter with mid-blue card and the stone with dark red, and made them up in the same way, so I have a useful set of eight cards, that really show why Christmas is the season of Joy. 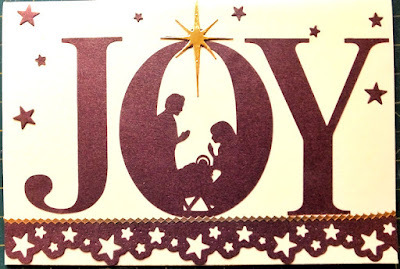 So I will pop over to the Rudolph Day Challenge at Scraps of Life by Scrappymo, to link this up. Then I have another card to make before tomorrow! 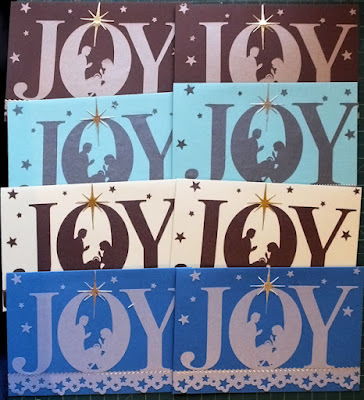 Fabulous cutting file Kate, super to get a good start on your Christmas cards..I really like this set. What a great set of cards Kate! Beautiful image there Kate, makes lovely cards. Really great image and some lovely colour choices, think I like the black and white the best, but not certain as they all look good. WOW! As if nothing is happening, but this card has such a great message. I love this design, where the Holy Family was woven in one of the letters sentiment. These are great Kate, I really like the design and it looks good in all the colours. These are stunning. Love that image. I don't have a Silhouette but have long been tempted to get one. I do have a friend that would cut me a couple images though...especially if I bought her the image for her collection! I like the colour combo's you chose and they look great with the scattered stars.